New Census figures released today show that millions of people in California continue to struggle to get by on extremely low incomes in spite of our state’s recent economic gains. Nearly 6 million Californians, including almost 2 million children, lived in poverty in 2015 based on the official poverty measure. In addition, poverty remained more widespread last year than it was in 2007 when the national recession began. Specifically, 15.3 percent of Californians had incomes below the official poverty line in 2015, down from a recent high of 17.0 percent in 2012, but still well above the state poverty rate in 2007 (12.4 percent). Also, more than 1 in 5 California children lived in poverty last year (21.2 percent), down from a recent high of 23.8 percent in 2012, but still well above the child poverty rate in 2007 (17.3 percent). The fact that millions of people lived in families that could not adequately support themselves in 2015 — six years after the end of the national recession — underscores the need for California to do more to ensure that all people can share in our state’s economic progress. This report highlights key findings from the data released today and outlines specific steps policymakers can take to increase economic security and opportunity in California. 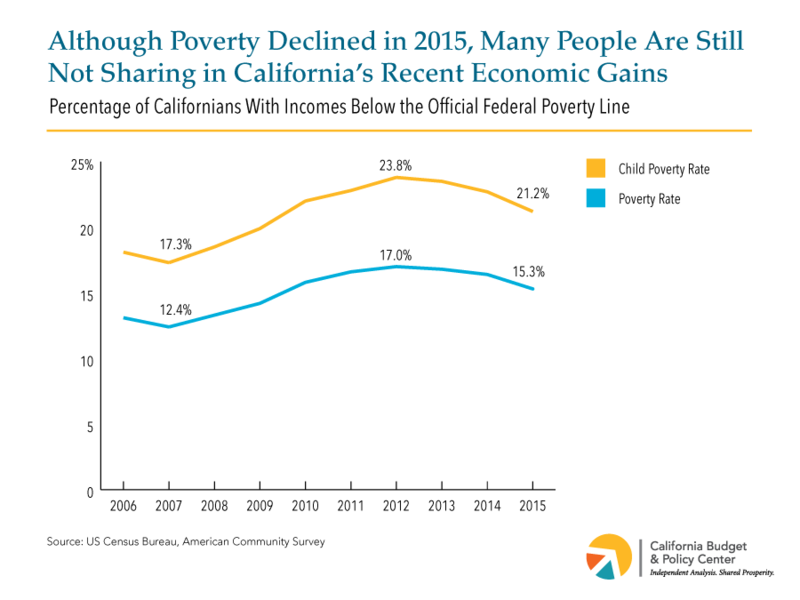 Although the newest Census figures show that poverty remains unacceptably high, they understate the number of Californians struggling to get by because they reflect an outdated measure of poverty. Figures released earlier this week based on an improved measure – the Supplemental Poverty Measure (SPM) – show that nearly 8 million Californians, 1 in 5 state residents (20.6 percent), could not adequately support themselves and their families, on average, between 2013 and 2015. California also stands out as having the highest poverty rate in the nation based on the SPM. This report, however, focuses on the official poverty measure because this measure provides a comprehensive look at state poverty trends and poverty rates for specific groups. The data released today show that although children make up less than one-quarter of California’s population (23.4 percent), they account for nearly one-third of those living below the official poverty line (32.3 percent). Furthermore, black and Latino children are about three times as likely as white children to live in poverty. Nearly one-third of black children (31.0 percent) lived in poverty in 2015, as did more than 1 in 4 Latino children (28.5 percent), compared to just 1 in 10 non-Latino white children (10.3 percent). If the official poverty rate for black and Latino children were equal to that of white children, nearly 950,000 fewer California children would live in poverty, and the state’s child poverty rate would be cut in half. All parents want a strong future for their children, but parents who struggle with inadequate incomes often face challenges in creating a better life for their kids. Research strongly supports making greater public investments to boost families’ well-being so that all children — including those whose families have historically faced the greatest barriers to opportunity — can have a stronger future. Compelling evidence from national studies shows that supplementing low-income families’ incomes can increase children’s life chances. Even modest increases in the incomes of low-earning families have been linked to improved health, greater academic achievement, and higher future earnings for those families’ children. The research also suggests that increases in income matter most during children’s first few years of life when their brains are developing rapidly, making them particularly vulnerable to the damaging effects of poverty. Making sure that parents earn enough to support a family. Most families in poverty work, which means that low-wage jobs and not enough work hours prevent many people from getting ahead. California’s recent commitment to gradually raise the state’s minimum wage will restore decades of wage erosion, but policymakers should do more to help workers create a more secure future. Helpful steps would include strengthening California’s new tax credit for low-earning working families, the CalEITC, and giving workers the right to fair scheduling In addition, California could do more to protect people from predatory lending practices that often trap low-income borrowers in a cycle of debt. Helping parents to afford high-quality child care so that they can work. High-quality, affordable child care is out of reach for many California families. The typical single mother would have to spend at least half of her income to afford center-based child care for two children in nearly every county in the state, according to our Women’s Well-Being Index, and California falls far short of providing enough affordable child care slots for families that need them. At a minimum, state policymakers should develop a multi-year plan for restoring all of the subsidized child care slots eliminated by budget cuts beginning in 2007-08. However, fully addressing families’ need for affordable child care will require a significant and sustained investment in a much bolder approach that aims to provide all families with access to high-quality child care and preschool. Helping families to afford decent housing. The majority of low-income households in California spend over half of their incomes on rent making it difficult to afford other necessities and save for the future. Policymakers could begin addressing this problem by better targeting state spending on housing assistance to people who need it most. Currently, California spends 45 times as much on the mortgage interest deduction — a tax benefit that primarily benefits households with six-figure incomes — as it does on the state’s renters’ tax credit, which provides extremely limited assistance primarily to moderate-income renters. Making sure that families can count on a strong safety net when they experience hard times. A majority of adults will face economic hardship for at least one year during their prime working years, and nearly half will turn to a major safety net program for help. This fact underscores the importance of making sure that our public supports allow people to meet their basic needs during tough times as well as prevent children from suffering the lasting consequences of poverty. Policymakers could begin to shore up California’s safety net by strengthening CalWORKs, the state’s welfare-to-work program, which has suffered from years of disinvestment. Helpful steps would include 1) raising grants so that CalWORKs at least lifts children out of deep poverty, 2) eliminating the “asset test” to qualify for CalWORKs assistance, which discourages low-income families from saving, and 3) restoring the maximum amount of time that parents can access welfare-to-work services to 60 months in order to increase their chances of securing stable employment. Allowing families to save and build a more secure future. Nearly half of workers ages 25 to 64 are projected to struggle to make ends meet in retirement — a problem that partly reflects inadequate access to job-based retirement plans. State policymakers are on the verge of taking an important step to help more workers prepare for a secure future. Pending approval by the Governor, a bill passed by the Legislature last month would create a voluntary, portable retirement account for workers without access to workplace savings plans. As a next step, policymakers should shore up workers’ earnings and reduce pay disparities so that more people are better able to save for the future. All Californians have a stake in policies that give children the chance to succeed, but children cannot thrive unless their families thrive. By investing in policies that increase families’ well-being, policymakers can create a stronger future for California’s children — and for all of us.